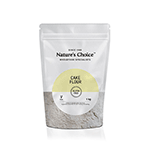 Nature’s Choice Gluten-Free Cake Flour can be used to replace regular flour cup-for-cup – for best results make use of our wide selection of gluten-free recipes available. If you suffer from frequent headaches, nausea, bloating and digestive problems, you may be gluten intolerant. It’s not the end of the world though. Contrary to popular belief, gluten intolerance does not resign you to a boring, tasteless diet that cuts out all your favourite foods. If you understand your allergy and know how to manage it correctly, you can make sure that you don’t have to give up bread, cake or even those delicious scones.